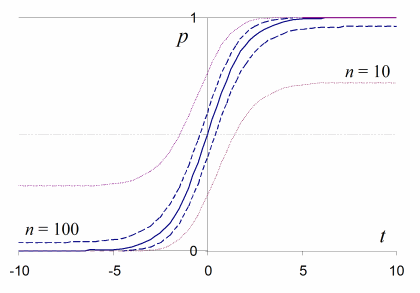 Back in 2010 I wrote a short article on the logistic (‘S’) curve in which I described its theoretical justification, mathematical properties and relationship to the Wilson score interval. This observed two key points. where ‘log’ is the natural logarithm and logit(p) ∈ [-∞, ∞]. Wilson score intervals for p ∈ (0, 1) are symmetrical in logit space, i.e. logit(p) – logit(w⁻) = logit(w⁺) – logit(p). Logistic curve (k = 1) with Wilson score intervals for n = 10, 100.